The girls have chosen to support a range of charities, including Special Olympics, Cayman Islands Crisis Centre, New Self Help Community Foundation; Meg High’s Children’s Cancer Foundation, Cayman Aids Foundation, Central Caribbean Marine Institute, Department of Children and Family Services, Cayman Hospice Care, Cayman Islands Red Cross and Cayman Islands Cancer Society. Encourage people to come and support the young women at the event on Saturday at 6:30 Miss Cayman Committee Chairperson Lynn Bodden said it was a great cause as the contestants are giving back to the local community. The ten girls were recently given several tips on the beauty trade at an orientation session on hair and make-up as well as diet and nutrition alongside the current Miss Cayman Islands, Cristin Alexander. If it is brains you are looking for, go check the library. This is a beauty pageant, straight up. Lindsay for Miss Cayman, you go girl!!!! Looking forward to the big day (pagent day) and see a lot of potential, but I have my eye on Miss Alyssa Christian. Feel that she is a strong candidate for the title. All the best Lyssa! Know that you will do an excellent job! I do hope that we don't see any of the silly (and sometimes nasty) debate about who's really Caymanian, or who isn't really Caymanian because they have foreign parents etc. etc. Good for you girls, whatever your origins, and you go represent Cayman the best you can. Alyssa is the best! She is cute and smart! Best wishes to all the contestants. It takes much courage to put yourself in the public and open to criticism in this way, and I hope that the Caymanian people realise how brave these women are. May the best woman win! I really like the girl in the middle in the little black dress, I believe that she will be the next Miss Cayman 2011! ALYSSA CHRISTIAN! Proud of you Lys! I believe that Alyssa would be the perfect Miss Cayman. She has all the qualities that are needed to be a great representative of the Cayman Islands. She's got the beauty, brains, and personality! Go Lyssa, you've got this babe!!!! Alyssa for Miss Cayman 2011!! Em…so what's the "L" for? You missed that part huh?? Oops…sorry. Was distracted by my child! Crystal has got the whole package – Beauty and Brains! Good Luck girl! I hope that the contestants will not only be judged by beauty alone, but also on CHARACTER! Not on swim wear but on intellect and knowledge. Please pick someone that can live life sober and make concious decisions. Good Luck to all of the ladies that entered this year! I must say I am very delighted in the selection of wonderful females this year. My favorite is Janelle M.
That someone is Alyssa Christian. Lindsay already looks like Miss Cayman. LINDSAY JAPAL FOR MISS CAYMAN 2011!! However best wishes to all the ladies. Wow! Why are people putting "thumbs down" for someone's personal choice? If you personally have a favorite then you shouldn't dislike someone else's decision. Imagine how the girls feel reading these comments. Caymanians please stop putting down one another. We must build each other up. Good Luck to all the ladies and may the best win. I'm hoping Janelle wins; she at least she "seems" worthy. I dunno about this pageant stuff though….Cayman never seems to place?? Alyssa is a real Island girl. I have had the pleasure to spend time with Miss Christian and she is the complete package and I believe the perfect ambassador for the Cayman Islands. She has the combination of beauty, virtue and brains. Good luck Alyssa. Alyssa I am so proud of you. You are such an intelligent, beautiful young lady from the inside out. Your unselfish and giving personality to your family and your community is uncanny. 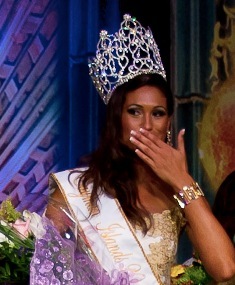 All the qualities that you possess make you the BEST candidate for the title Miss Cayman 2011. Not trying to put down the rest of the ladies, but I think they should all stop wasting thier time and just let the present Ms. Cayman give the crown to Janelle!!! She’s smart and beautiful! Go Janelle…. Love, Secret Admirer! I have known Jessica Ebanks all of my life and I am so happy she has decided to enter the pageant as she has all of the qualities to make a beautiful and intelligent ambassador of the Cayman Islands. Go Alyssa. You will be a remarkable ambassador for the Cayman Islands. bring on the bikini pics….. Wonderful to see there is this many young women participating for Miss Cayman this year. Good luck to everyone of you!!! You will make a phenomenal ambassador for Cayman. Best of you luck to you. Regular readers know my stance in regards to "beauty pageants" and I will not go there again. Nevertheless, I simply had to post a comment in support of Ms. Janelle Muttoo. That is one intelligent, respectable and pleasant young lady that is going places in life. I admire her natural yet professional on-screen (TV) presence. A true and welcome breath of fresh air is she. Good luck to all the other contestants – but Janelle is my favorite to win this oft cringeworthy competition. * Again, I am a smart, tall, handsome, buff, ebony Adonis that more than fills out a zesty pair of Speedos … can a brother get a university scholarship and car as well?! GO SISSY!!!!!! So proud of you!!! Hopefully they pick the best contestant that can compete internationally. Someone with a personality and brains perhaps? If you are looking for brains and personality, look no further then Alyssa Christian. I hope she knows the difference between 'then' and 'than' unlike yourself…..
Beauty in the eyes of the world.